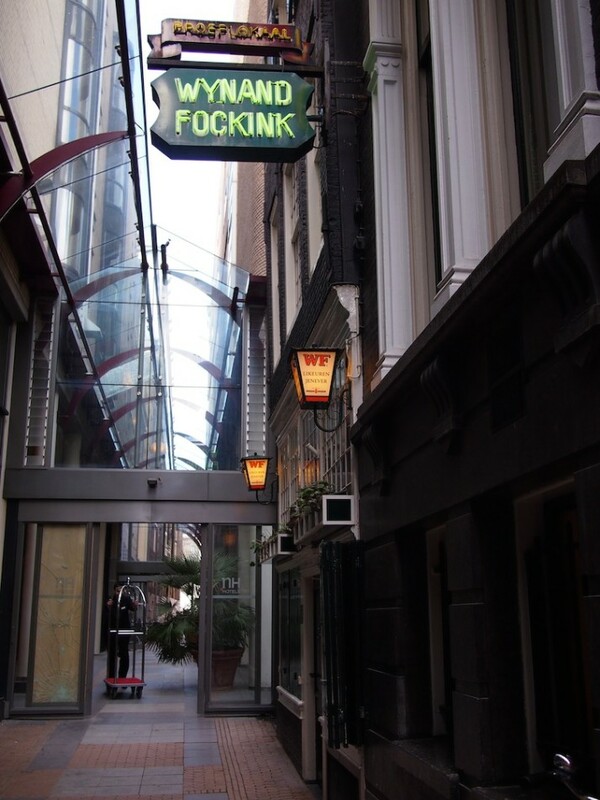 Jenever is the national liquor of The Netherlands and Belgium, and while we’re quite partial to a gin and tonic, we’d never heard of Jenever, which happens to be gin’s ancestor.. time to get acquainted..
We booked ourselves on a 1 hour tasting session at the Wynand Fockink distillery which was established in 1679, but Jenever is known to be much older. We’re glad we reserved a place by email as there was quite a crowd waiting outside before the start of the weekly tastings. After a short introduction about the history of the drink, the company, and how it’s made it was time to start tasting! Julie and I sampling the limoncello course.. Mmmm! Jonge Jenever – Young Jenever. In this case young refers to the age of the recipe not the ageing of the spirit! 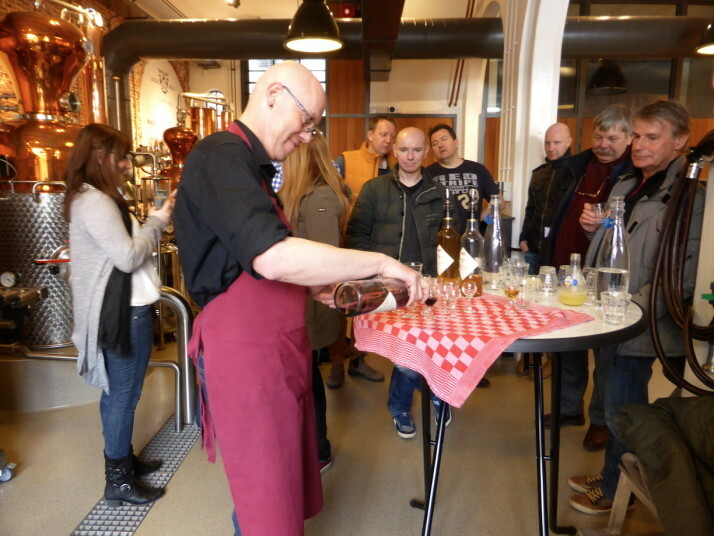 Oude Jenever – Old Jenever. The original (and best!) recipe. 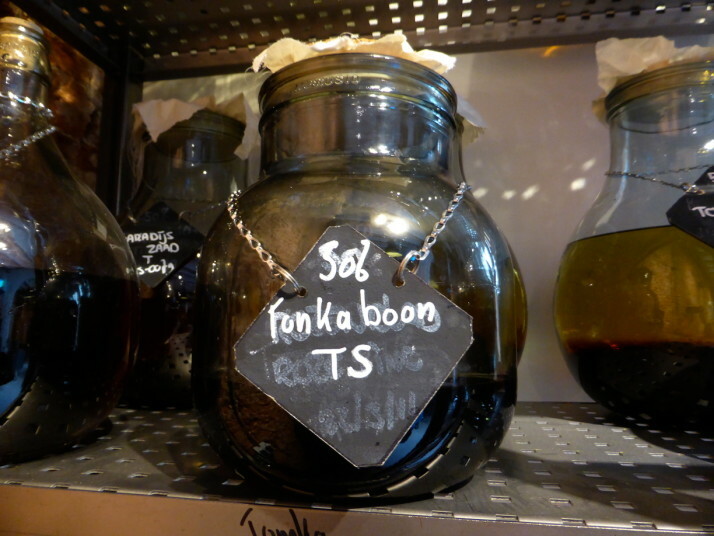 .. and Flavoured Liqueurs – For these the alcohol base is bought in and infused with pretty much any flavour you can imagine! The tasting started with the Jonge Jenever which we thought akin to vodka. 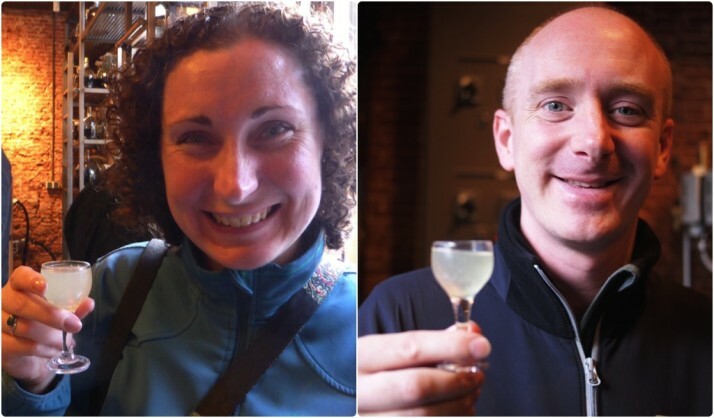 We found it quite harsh but not unpleasant – certainly nicer than drinking neat gin. Next up was the Oude Jenever which we thought had more flavour – the spices and juniper came through more and and it was easier to drink. 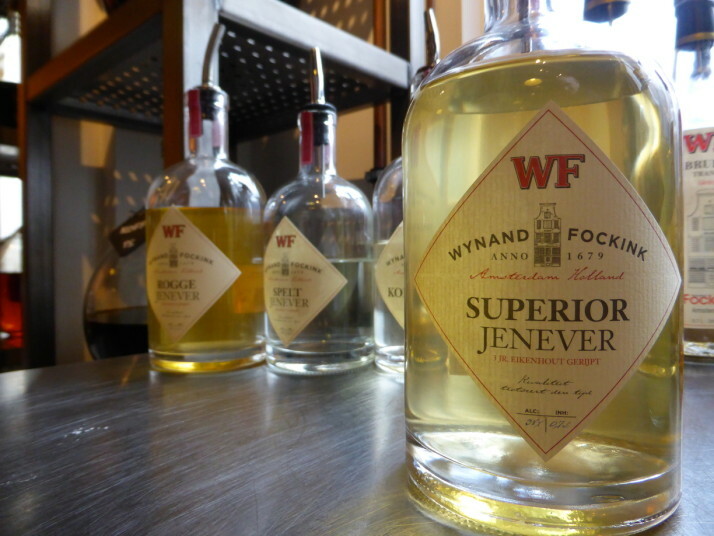 Both of these are aged in metal drums for about 6 months, but Wynand Fockink’s Superior Jenever is matured for about 3 years in old wooden Jack Daniels barrels and the Tennessee sour-mash easily dominates the subtlety of the spices. Andre then started talking about the many flavoured alcohols that the small distillery produces, and offered a taste of one of our favourite liqueurs – limoncello! After two different varieties, he said they have a flavour for every occasion or event in a person’s life, some with cheeky names like “Hansje in de Kelder” which translates as “Hansel in the cellar”, and is a Dutch saying similar to the English “a bun in the oven” – although they no longer recommend it for pregnant ladies! 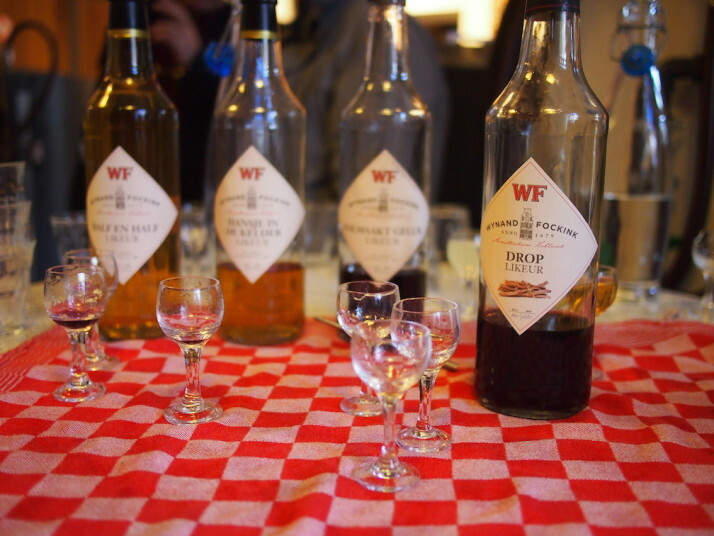 We also got to sample a few of the many flavoured spirits or liqueurs they make. Left to right they are: “Half and Half” – a blend of orange liqueur and spice infused liqueur (cloves and cinnamon); “Hansje in de Kelder” – “Hansel in the cellar” which tastes of orange, apricot and lemons; “Volmaakt Geluk” – which means “Perfect Bliss” and tastes of violets and roses; and “Drop” – salted liquorice, our favourite along with their limoncello! Next was his personal favourite flavour: “Drop” – which is liquorice in Dutch, and one of my favourite flavours too! While I was sipping away he said the sweet, salty taste is great for alleviating sore throats. Of the flavoured ones we tried, this and their limoncello were our favourites. In the end we sampled 3 Jenevers and 6 different liqueurs in about an hour. After the tasting session finished they opened up the bar next door to the public, but not until we’d had chance to visit their extensive gift shop and get another round in! 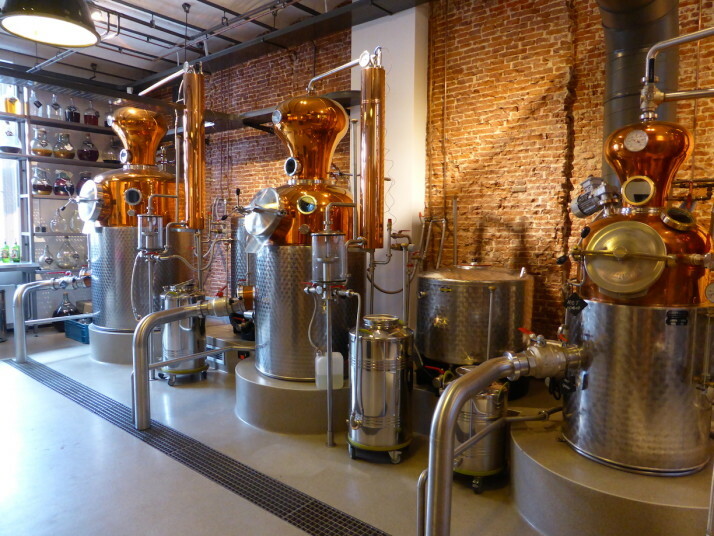 This entry was posted in Experiences, Places and tagged Amsterdam, Jenever, Netherlands on April 8, 2015 by Andrew.